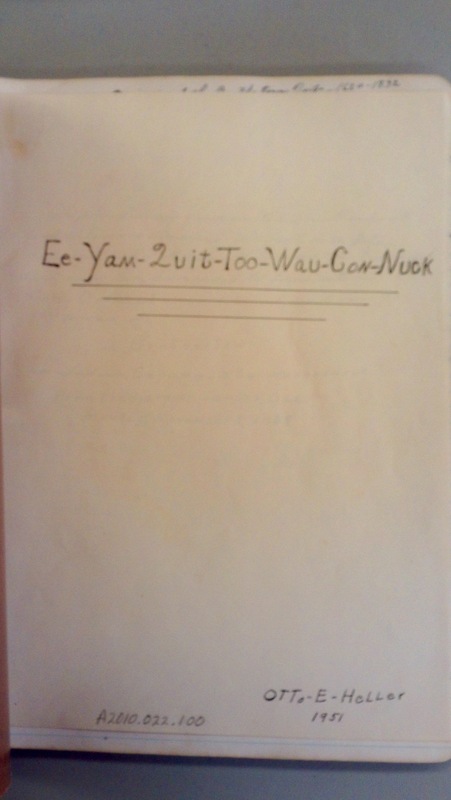 Because of its length and the challenge of reading the original script, Eeyawquittoowauconnuck is commonly spelled several different ways. For example, on page 536 of The History & Archaeology of the Montauk Volume III, 2nd edition, contributor Russell T Blackwood (a Professor at Hamilton College near old Brothertown in New York) quotes the famous Occom journal entry of November 7, 1785 thus: “…we named our town by the name of Brotherton, in Indian Eeyamguittoowauconnuck.” Here, an “m” and a “g” are used. However, it is most common to see the following two spellings: “Eeyawquittoowauconnuck” or “Eeyamquittoowauconnuck”. Otto Heller, the man responsible for gathering the items now found in “The Brothertown Collection”, preferred the latter spelling. Heller spent a lot of time and money researching and collecting Brothertown knowledge, books, and artifacts. It is not known for certain, but is very probable that he visited Dartmouth College and read Samson Occom’s journal for himself. According to Heller, the Indian name of Brotherton appeared to be “Eeyamquittoowauconnuck”(see Figures 1 and 2). Another person who used an “m” in the name, and perhaps where others have gotten their spelling, is William DeLoss Love in his 1899 book, Samson Occom and the Christian Indians of New England (https://archive.org/details/samsonoccomchris00love). Eeyamquittoowauconnuck is probably the most commonly seen spelling of the name although there are plenty who use a “w” instead of an “m”. For example, in the Joanna Brooks book, The Collected Writings of Samson Occom, Mohegan, snd in Craig Cipolla’s writings, “Eeyawquittoowauconnuck” is used. This is also how it is transcribed at Dartmouth’s Occom Circle site (https://collections.dartmouth.edu/occom/html/diplomatic/785554-diplomatic.html). Thanks to the Circle site, we are able to see a high quality scan of Occom’s journal for ourselves. Let’s take a closer look. 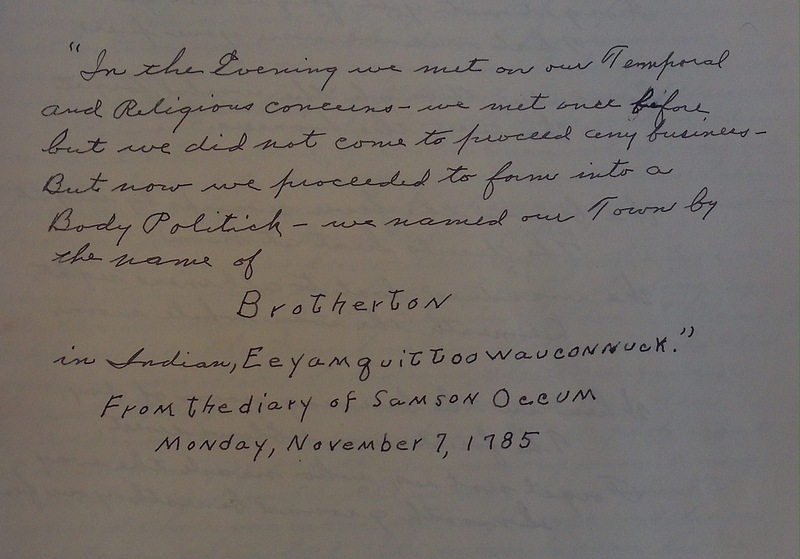 In Figure 3 above, beneath the underlined “Brotherton”, you can see the first 13 letters of the Indian name. The 5th one could appear to be an “m” or it may look like a “w”. Let’s zoom out and look again. Find the name in Figure 4 and look at the “w” after the double o’s midway into “Eeyawquittoowauconnuck”(directly beneath the “n” in “Brotherton”). Notice that it ends in an upswing which points a bit back toward the left. Now, look at the letter in question, the 5th letter. It also hooks back to the left in exactly the same way. Next, look at the ending letter “m” in the word “form” (middle of the 2nd line from the top) and, at the very bottom of the page, the name “Abraham”. Both “m’s” end with a rightward slant. Occom’s “m’s” slant right while his “w’s” hook back to the left. 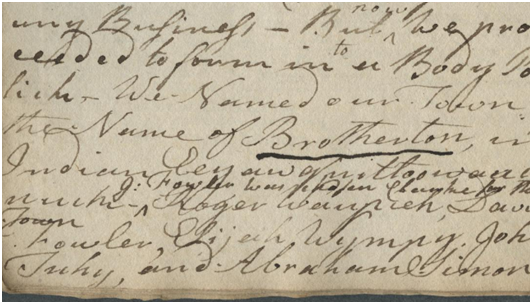 Judging by the formation of the “m’s” and “w’s” in this sample alone, it seems pretty certain that the original Indian name for Brotherton does not include any “m’s”. It appears that Occom wrote it as “Eeyawquittoowauconnuck”. *The photos in Figures 1 & 2 were taken by Gabriel Kastelle. Figures 3 & 4 came from the Dartmouth College Occom Circle site.